Bullied at prep-school and unappreciated at home, all young Theodore Ellsworth wanted was to be like the heroes in his favorite fantasy tales. Whisked away to the Gossamer City and chosen to embark on a quest to save a kingdom, he thought he’d have his chance. Left for dead in a place where malicious spirits feast on the living, Theo has only just begun to learn that glory comes at a price. With his new friends fighting for their lives, Theo is thrown off course and embroiled in a murder mystery that must be solved before he can save his little sister from a gruesome fate. A crackpot inventor and a pure-hearted young knight are on the job, but Theo already knows the killer. He sees the Beast of Calharik every night, when he looks down in terror at his own bloodied hands. Let me start by saying that this is epic fantasy at its finest. Everywhere the Road Ends picks up right where the last ends, with Theo under the nefarious influence of the Reflectia Woods, all alone and out of his mind. Marie, his sister, and the other “contrary” members of his party, on the other hand, are just arriving at Kell, continuing the mission to find out why contact was lost. What they find shakes everyone to their core, particularly Tessa, who came from the city. 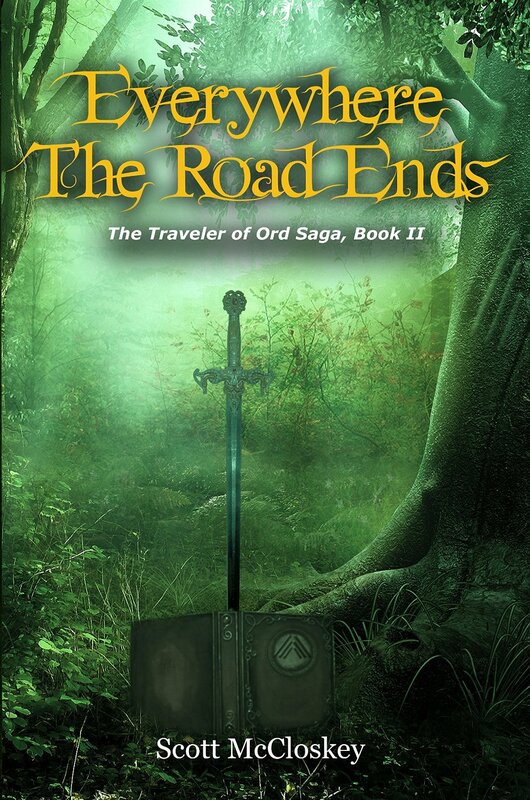 And, Theo’s path takes him into an adventure of his own, where he must track down a murderer if only to prove to himself that he himself is not responsible. Overall, I love this book. The whole thing flows smoothly, even throwing in the complexity of two complete storylines within the main one, from multiple perspectives. Most of the main characters from the first book have at least a couple of chapters from their point of view, and a couple of new ones do, too. It works, and it allows you to really dig into each character and find out what makes them tick, what they fear, and what motivates them. The experience is immersive and makes the book hard to put down. I also dig how disparate the various realms of the Goldenwealth are. From the shimmering capital where the council rules to Calharik, a decidedly steam punk city, complete with steam work robots. I can’t really talk about Kell due to spoilers, but the traversimorphs that live there are still my favorite of the bunch. They bleed and blush blue, they are infused with magic, and they have a very unique life cycle. Aside from the occasional missing or misspelled word, there is very little I don’t like about this story. I suppose the timeline altering attacks of the main villain, which are just now coming to light, can be confusing at times. The changes are drastic, but their effects don’t seem to hit everywhere at once, instead traveling in a wave of sorts, a big contributor to the confusion. So, for that reason, I think I’ll need to reread all of these once the final book or books in this series are released. Like any good epic fantasy, there’s a lot that will likely be clearer once the whole story is known. I highly recommend this book and the series as a whole to fans of fantasy, epic or otherwise, and perhaps even to those who enjoy a bit of steam punk, murder mystery, and battles. I am grateful to have received a free copy of this ebook for review.